Hey, guys! I can’t tell you how great it felt to be back in the kitchen in DIY mode. It’s been a while, to say the least. 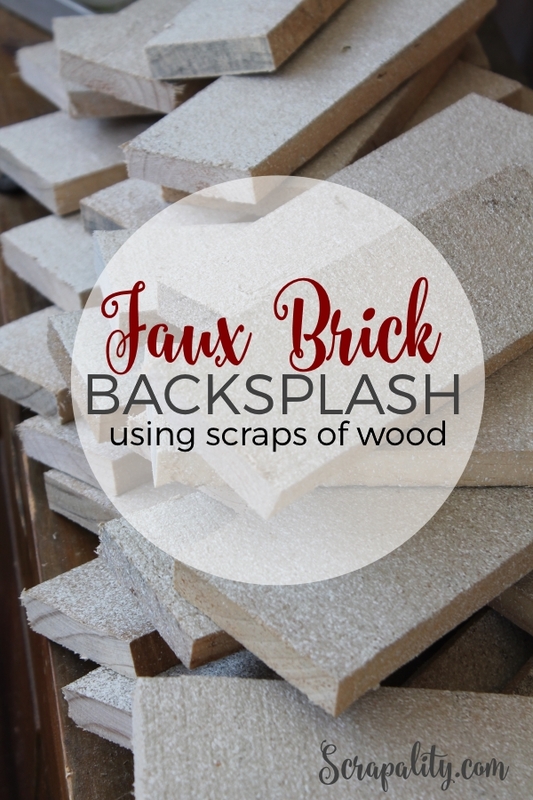 Today, I’m going to show you how to turn reclaimed wood into faux bricks for a one of a kind backsplash for your kitchen. Not only is it one of a kind, it’s also is easy to do and inexpensive. 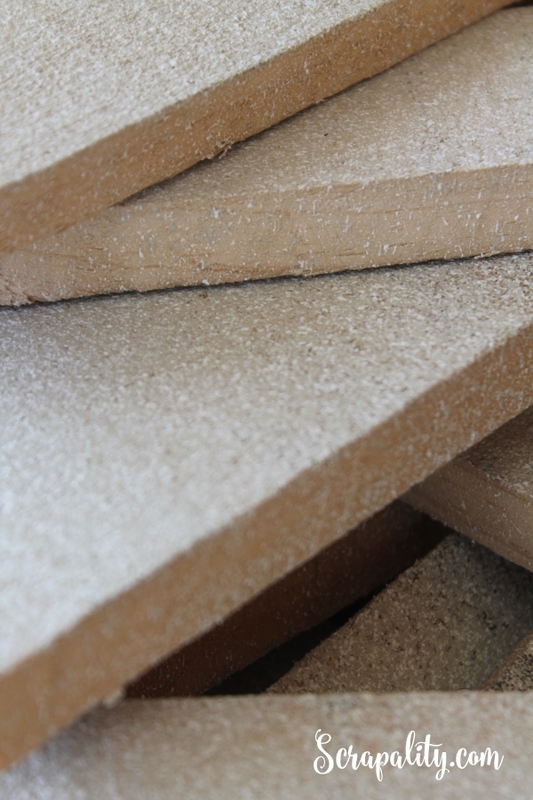 To begin, determine the size and number of bricks you will need for your project. 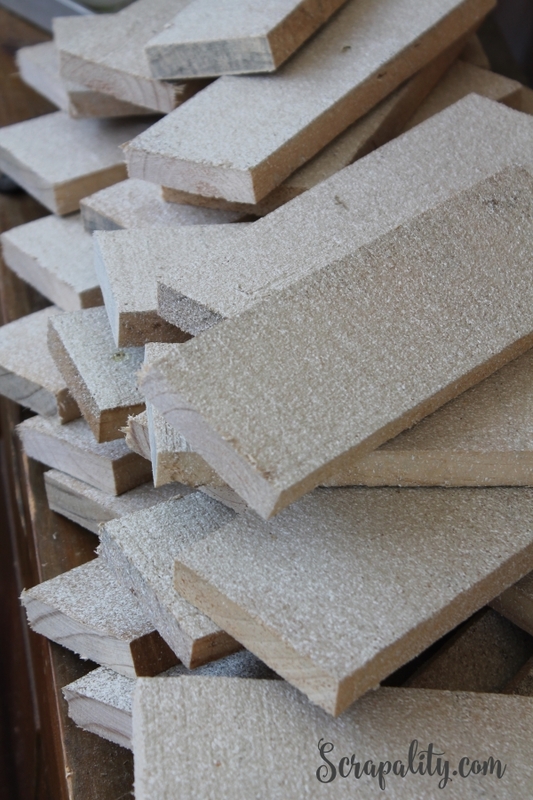 I used a miter saw to cut each brick about 2 3/4″ x 8″ and 3″ x 8″ in size. I also used leftover end pieces as long as they were the same width as the full-size bricks to cut down on cutting-as-I-go while tiling the backsplash. Next, I sprayed the pieces with the Rust-Oleum American Accent Stone Textured Spray Paint to add texture to the wood pieces. The textured paint is easy to apply and doesn’t smell as bad as regular spray paint. The downside, it takes more paint to cover, therefore, one can don’t cover as much as regular paint. Plus, the stone textured paint costs more too. It also takes longer to dry. The directions state to wait 5-6 hours prior to handling. After allowing the pieces to dry overnight, I was pleasantly surprised with the overall coverage after just one coat. It covered really well and the texture was amazing. It really changed the whole appearance. Next, I started adding color using 4 colors of spray paint. This process is super fast and easy. No brushes needed. Just spray and wait to dry. Love it! First, I covered each piece with Rust-Oleum in Colonial Red. I made sure I coated the top and sides of all of the pieces. 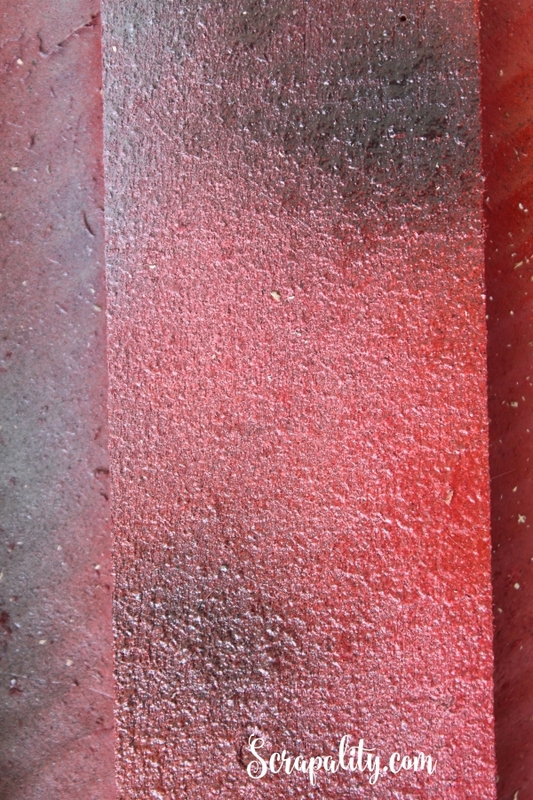 I allowed the red to dry for about 15 minutes before adding the next color. Next, I lightly sprayed in random locations using Rust-Oleum in Paprika. I added the paprika-colored paint to break up the constant red color. Then, after waiting about 15 minutes, I added Rust-Oleum in Dark Gray in various locations. The final color I used was Rust-Oleum in Dark Walnut. I added the Dark Walnut overlapping the Dark Gray. The gray and walnut blend together to create a blended light and dark area as seen in the picture below. 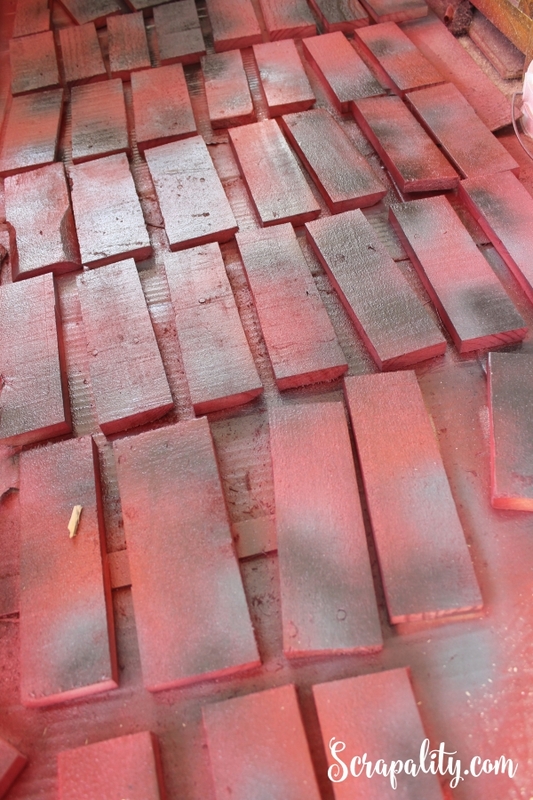 So what do you think of the faux bricks so far? Does this piece look like wood or brick? 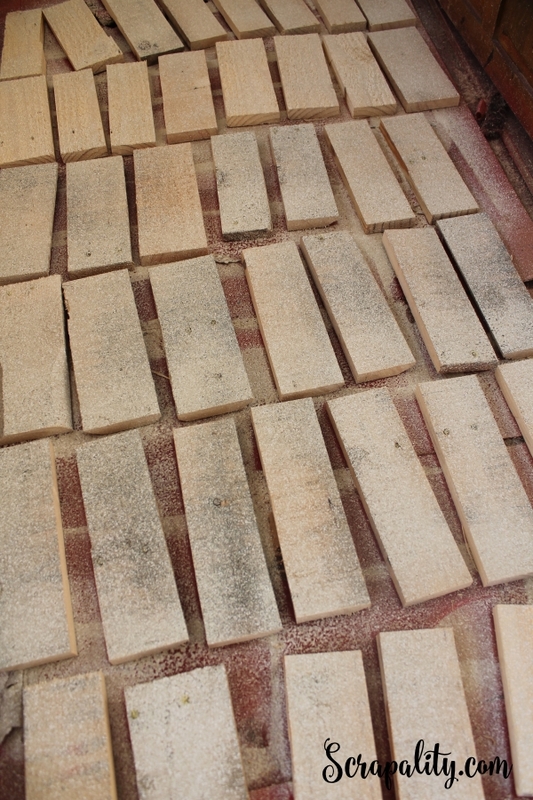 Stop by next week for the second half of the Faux Brick Backsplash project when I apply the faux bricks to create a super inexpensive backsplash. I shared this post with some amazing blogs. Wow, pretty neat idea! Can’t wait to see the finished project! Thanks for sharing with us at Brag About It! Pinned and tweeted! Thanks, Laurie! The completed backsplash turned out great. Hope you stop by to view the post. Thanks for stopping by! I’m really interested to see how the bricks come together on the wall – I like the four colour spray painting technique too! Thanks, Nicole! It doesn’t get any easier using layered spray paint. It’s quick and easy to do. Cool idea. So glad you shared this creativity with us at Merry Monday. That last piece does look like a brick. I can’t wait to see the final result. Thanks, Shirley! The finished look is live. I would love for you to stop by and visit again. This is great Andrea ~ love the faux bricks! Thank you for sharing @Vintage Charm! Pinning to our Features and Favorites! Thanks, Cecilla! I’m so glad you had time to stop by today.